We have exciting news to share. The Albright Memorial Library will officially reopen on Monday, March 19, 2018 at 9:00 AM! 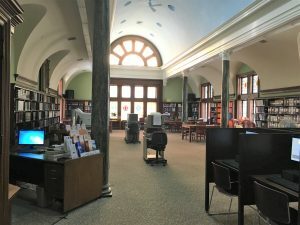 We know it has been a long journey, and we want to thank all of you for your support and patience as we gave the library some much-needed TLC. The Albright Memorial Library hours will be Monday – Thursday 9 AM – 9 PM; Friday 9 AM – 6 PM; Saturday 9 AM – 5 PM; and Sunday 1-5 PM. Our library services will remain in the same location as before the renovations. Circulation services (returning, browsing, and checking out books) will be on the first floor of the library. Reference services will be upstairs on the second floor. Microfilm, newspapers, computers, and printing/faxing will all remain in Reference. These services are now contained in one room upstairs. The second room has been renovated as a Lecture Hall, which will be used for the library’s meetings and programs. See pictures below for details. 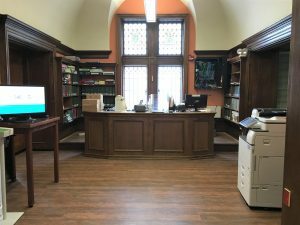 During your visit, make sure to check out all of the refinished woodwork in the lobby area, the new circulation desk, the renovated bathrooms, and the new flooring throughout all of the library. 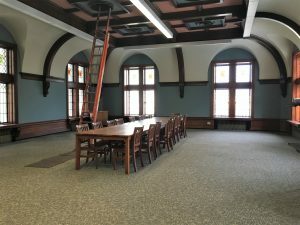 Reference services will be in this room, including computers, microfilm, and newspapers. Reference Desk now has printers and a reading table. 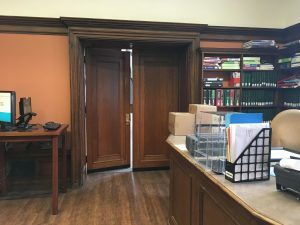 The doors to the Lecture Hall located on the other side of the Reference Desk. Lecture Hall room where meetings and library programs will be hosted.